Status. Exclusivity. Passion. These are all things that you'd find plastered on a cheesy motivational poster in a sub-par insurance agency, and they're also the stand-out qualities of this iconic Ferrari 348 ts, which can now be yours for the price of a lightly used Ford Mustang GT Convertible. Can you even? Because I can't. 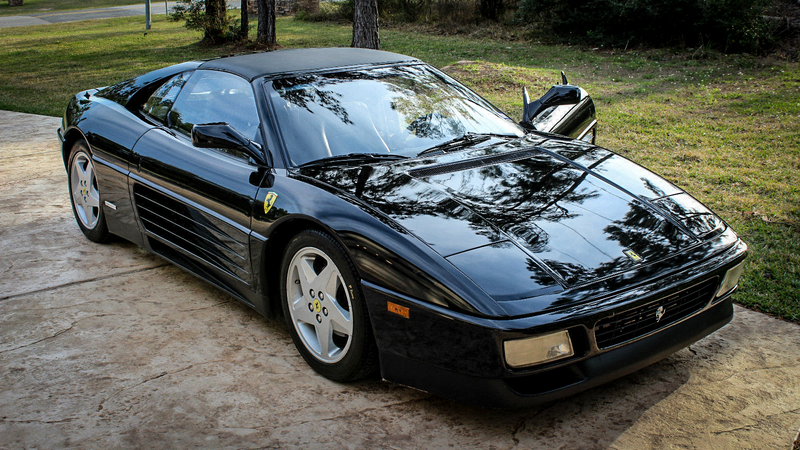 This 1990 Ferrari 348 TS has a 3.4 liter V8 engine, producing around 300 horsepower. While this power figure may sound low, realize that this car is twenty-five years old. It also has a more rare black on black color scheme, which separates it from the pull-me-over traditional Ferrari paint code. It doesn't have any silly '90s F1 gearbox, only a row-you-own gated five-speed manual transmission. At less than $38,000 with a Best Offer option, it's the most no-foolin' Ferrari you can get for your money on the market today. I am the 4th owner of this wonderful black beauty and have put about 5,000 of the 35,000 miles on this car. The last owner told me he had the 30k service performed which would have been about 7 years ago. It has been garage kept, and covered its entire life. The body is in great shape, the paint looks very good, the interior is in good shape with a little bit of wear on the drivers seat. This car has had it's fluids changed at least once per year, and its last inspection the inspector said its emissions were better than a 3 year old Mercedes that had been in previously that day. The car runs and drives great on its Perelli P Zero tires. The engine and transmission work and sound great!The A/C & heater work well, and a new battery was installed a little while ago. If it were me purchasing this car, I would buy it and install a twin turbo kit to make the throttle response actually mean something. It's a Ferrari, after all. It should be able to hang with anything the modern world throws at it. Although Ferrari maintenance is more expensive than any regular car's, the ticket to the show is well worth the price of admission. You'll have a car that no one has, for a price nearly anyone can afford. Do it before I do.